I die. Why? Because Edition 38 show, that’s why. One of the busiest Volkswagen festivals of the year has just taken place and it’s always exciting to see the freshly built cars and the evolution of some old favourites, too. Hamish’s SWB quattro you see above is awesome. One of the best cars of the three day event, no contest. Hit up any quality gathering of Volkswagen group cars and your eyes will almost certainly be treated to some wheels of the magnesium split variety. 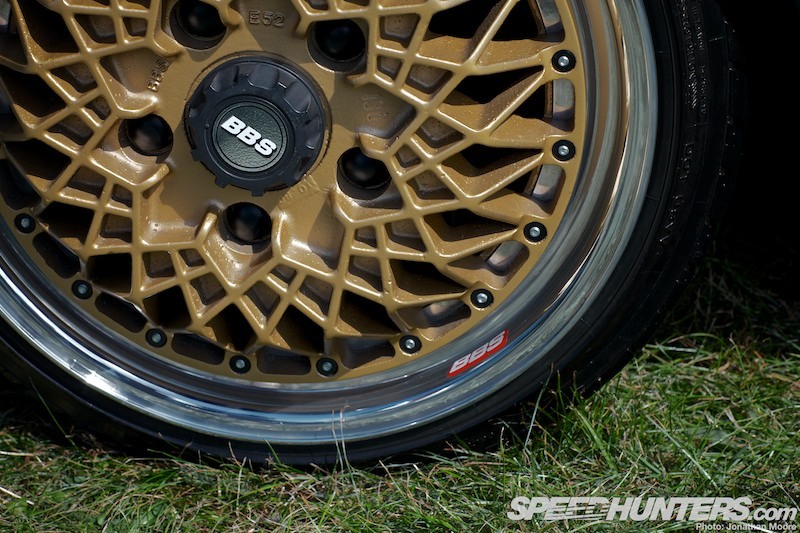 These stunning vintage BBS motorsport wheels on the quattro you see above started to become more prevalent in the Volkswagen scene maybe around five or six years ago. Alex Wright’s Mk I was put back together with a lovely G60 16v motor and a stunning set of step-lipped BBS Motorsport wheels. 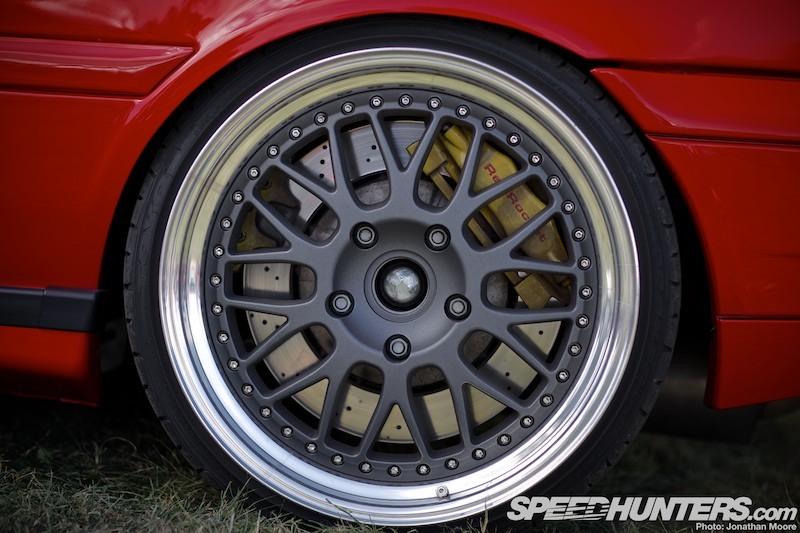 The magnesium centred E30 wheels have been run on the car for some time and are completely timeless. 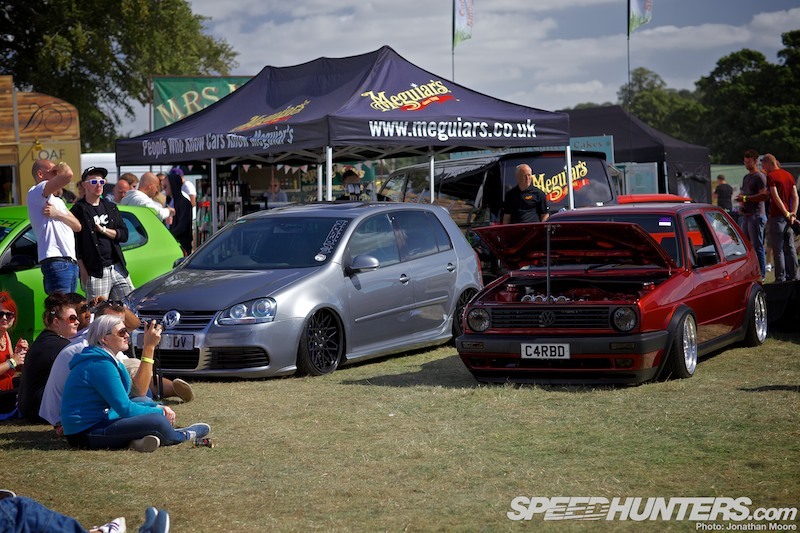 With the right weather, Edition 38 show provides the perfect Volkswagen festival atmosphere. With more magnesium split-rims than you could shake a stick at. 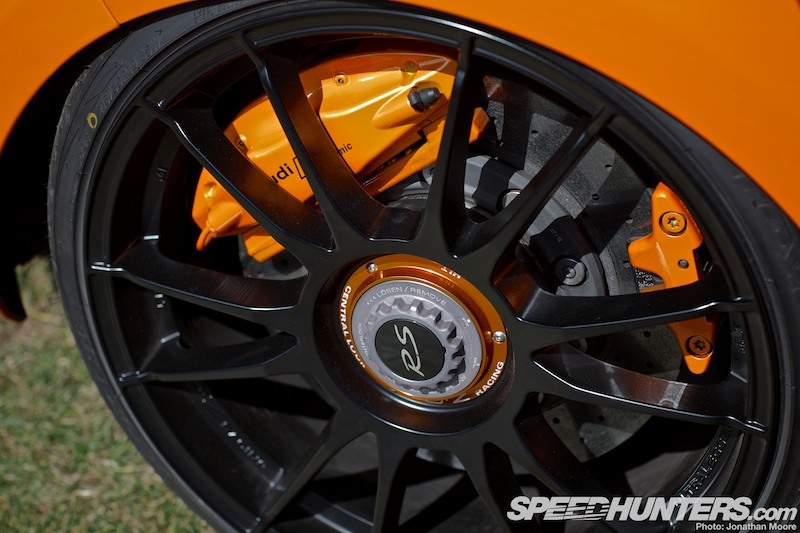 These Ronal Racing wheels have been a firm favourite with Volkswagen owners for many years. Clearly you can see where the inspiration for the Ronal Turbo came from. From incredible race-bred rolling stock to beautiful OEM wheels, Edition 38 never fails to deliver. 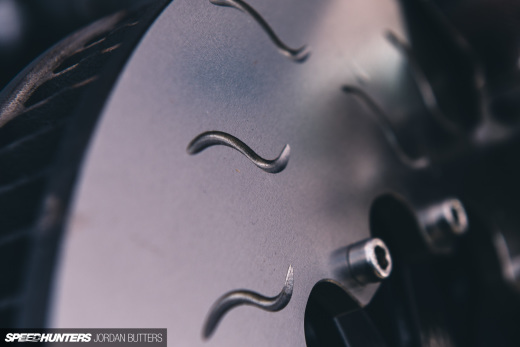 If you’re a dedicated die-hard wheel geek, then this place is like heaven. Greg Howell’s latest purchase, a stunning Audi A6 Avant, runs a perfectly installed air suspension system and 20-inch Audi S-Line wheels. 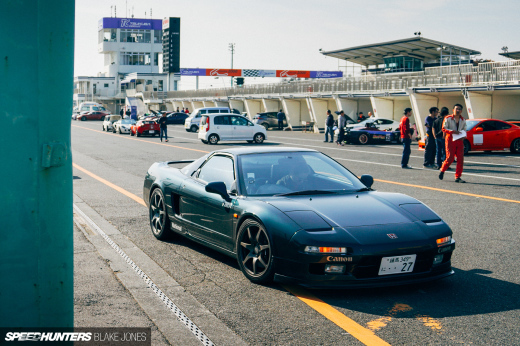 With Porsche brakes and a huge amount of space inside this makes for a perfect daily driver. We spotted this incredible Mk I Scirocco out in Wörthersee back in May. The Belgian car is nothing short of perfect. 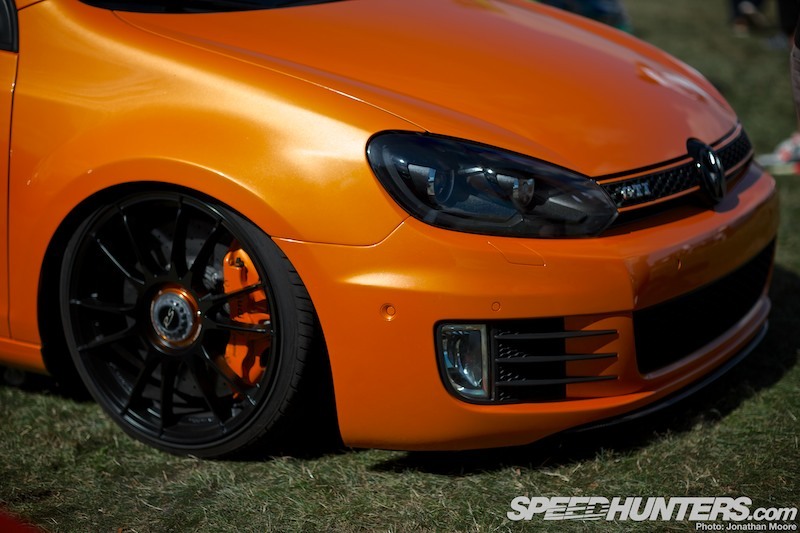 BBS have long been the staple wheel of choice for Volkswagen tuners, but on this car they really stand out. The effort involved in putting together a car like this is insane. And like Greg’s Audi Avant, Porsche brakes have been employed to take care of stopping the vehicle. The marriage of Porsche parts with Volkswagen builds has been a long running theme, which given the long relationship between the two companies, is totally understandable, of course. Talk of impressive braking systems and insane amounts of effort brings us nicely to this, the Red Rocket Turbo. The Golf Mk III featuring an R32 turbo is actually now an R33 courtesy of a full motor build. Using a Turbonetics GT1050 to force induce the lump, the car makes around 700hp at the front wheels! This build stopped me and Jonathan in our tracks. 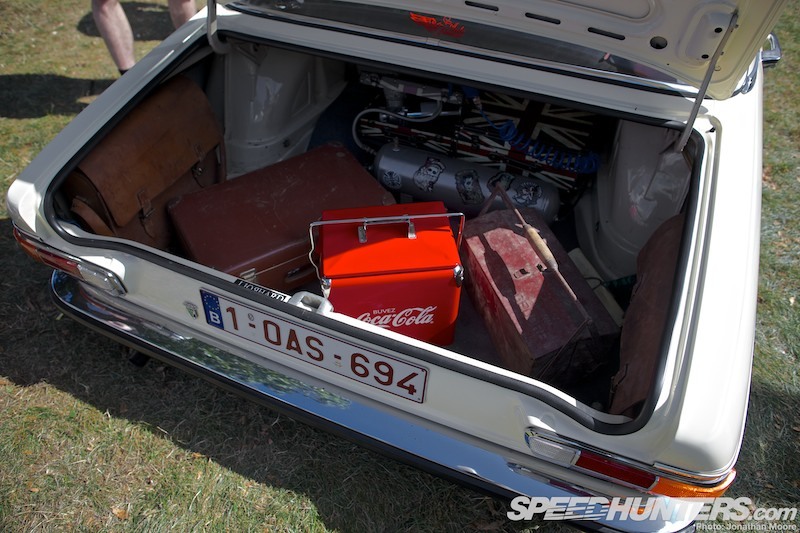 The owner, Markus Maier, brought some essential items for the 1000km road trip across from his German homeland. He also packed his wallet, which is just as well since the car’s motor drank six tanks of fuel! That’s basically a tank every 100 miles. How mad? 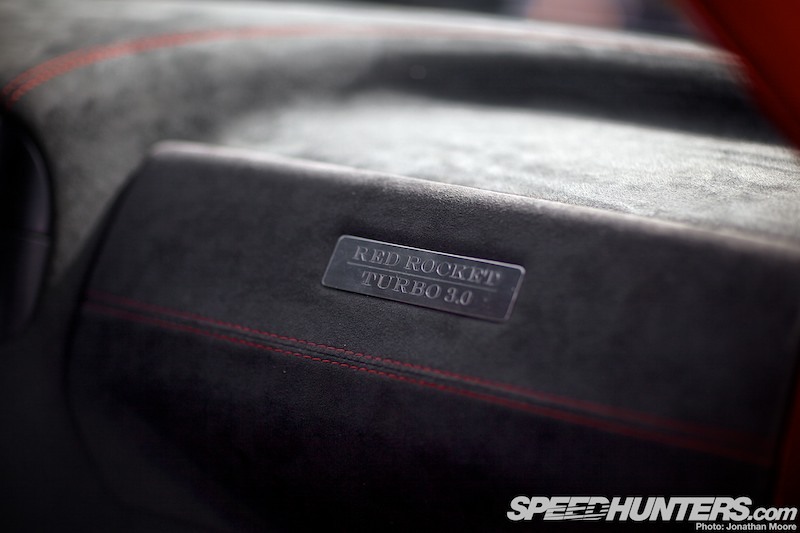 … whilst the red carbon details ensure that the Red Rocket is, well… Very red! Just in case the driver pilot forgets the name of his car, and he has time to look at the dash between the frantic gear changes and tyre smoke, then there’s a cool plaque just there to remind both Markus and his co-pilot. The gear shifter has an almost robotic feel to it and it’s clear that the driving position has been well thought out. And as for that gear shift display nestling at the bottom of the dash, well it’s nothing short of awesome. 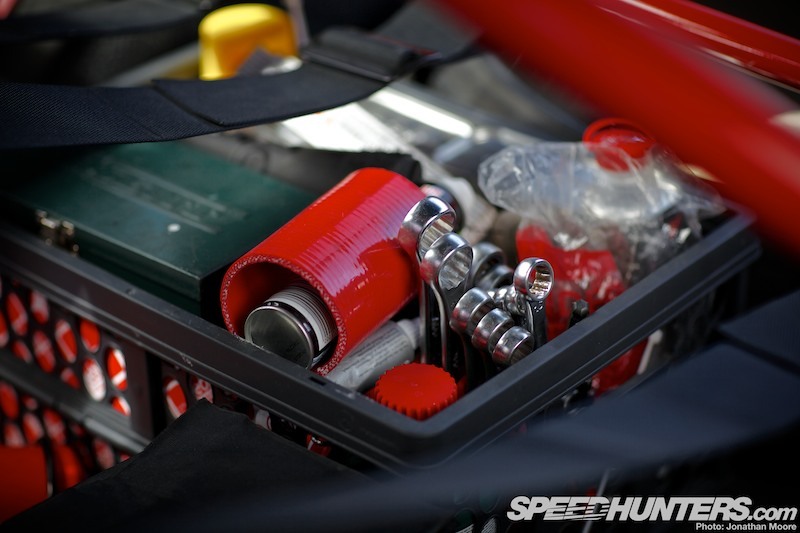 From every angle this car means business and the mega Audi R8 brake set-up ensures that the Red Rocket stops well. With a lot of full-on showpony Volkswagen cars rolling around the show circuit these days, this car makes a refreshing change. I will never tire of seeing Jason Buckley and Jamie Fagan’s stunning Mk I platform cars. We took a look at Fagan’s in last year’s walkaround report and this year it seems fair to check out Jason’s build. This car has a rare set of BBS E52 wheels – again, a common theme on some of these vehicles is the use of BBS Motorsport splits. The car looks very good indeed. Inside, a lot of VW builders are dropping the leather for cloth. 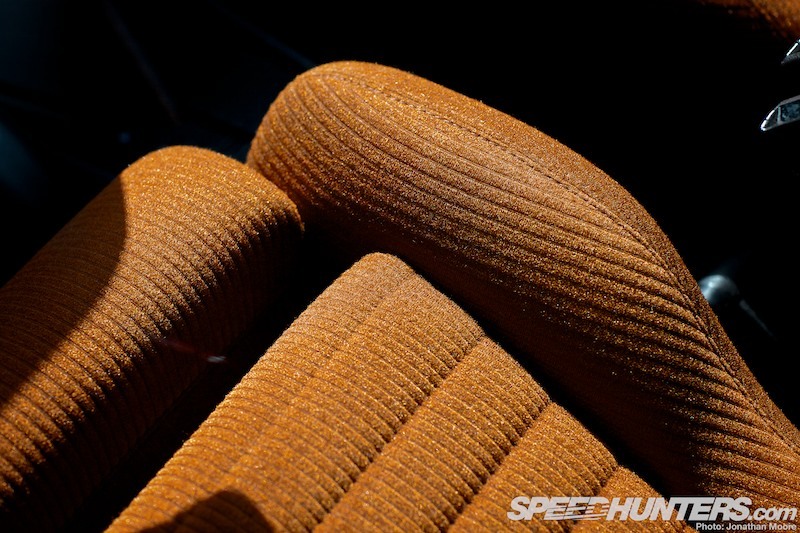 The texture is more interesting and gives the car’s innards a real retro vibe. Leather retrims are still cool, but twead and OEM Volkswagen cloth trim has been making a strong comeback over the past couple of years. It was great to see Russ Whitefield’s Mk II out at a show again. 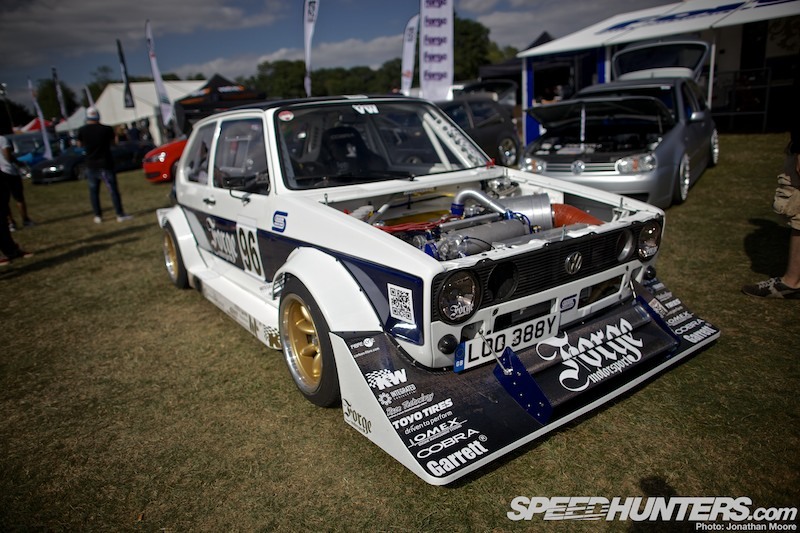 This Golf really did bring attention to detail up a notch when Russ debuted this car a few years back. Originally running twin Weber carbs, hence the number plate, the 16v motor is now fed via throttle bodies. This car is a perfect example of a smoothed engine bay done right – with the identity of the bay still retained. Vehicle wrapping was pretty prevalent at this year’s event. Ryan Stewart’s Garage Midnight demo car was still looking fresh in its Matte Apple Green 3M hue. This is a very fast road/track car with 450hp on tap, all put down courtesy of a Wavetrac diff. The gold engine bay detailing was seen on a few other cars and with the bonnet off, it was easy to see the well crafted turbo conversion that helps to propel this Mk V to 180mph. 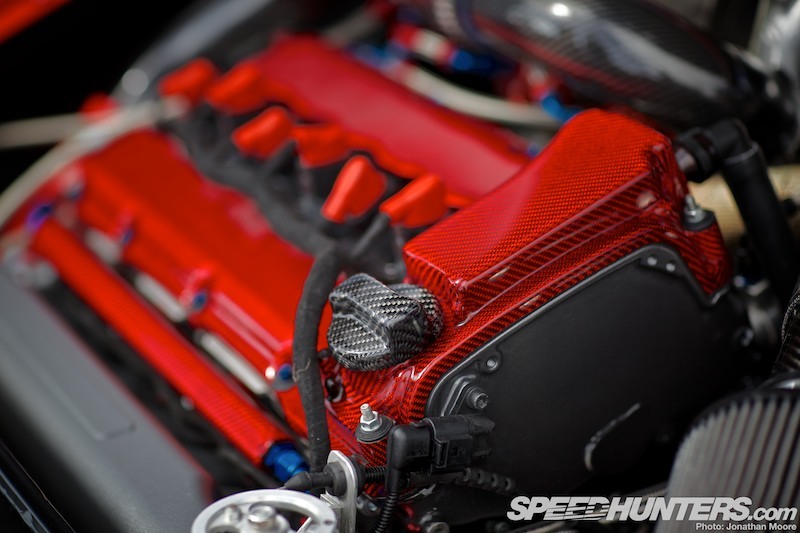 Another car doing the engine bay thing right is this Vento built by Gareth Spiller. 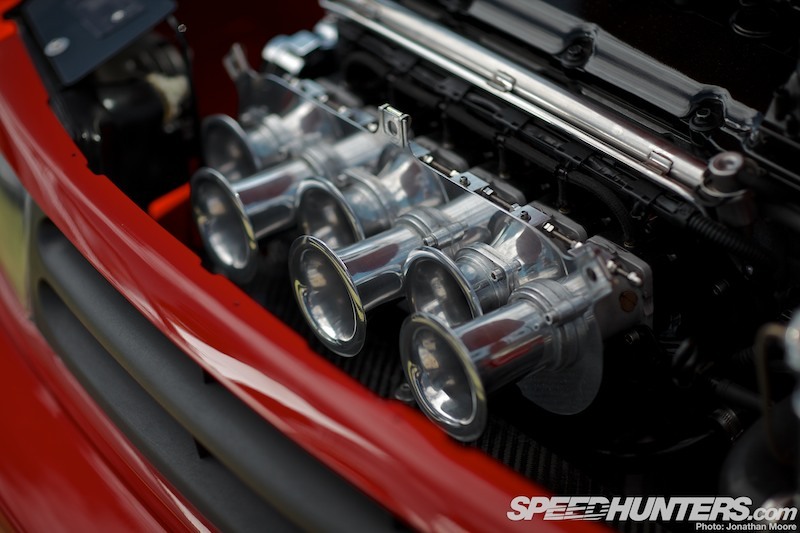 The throttle bodies in the clean bay not only look good, but they sound amazing. If there’s one word that could describe this event perfectly it would be chilled. I beginning to wonder if you got a discount at this event if you had a red car? The colour red was definitely a theme this year! 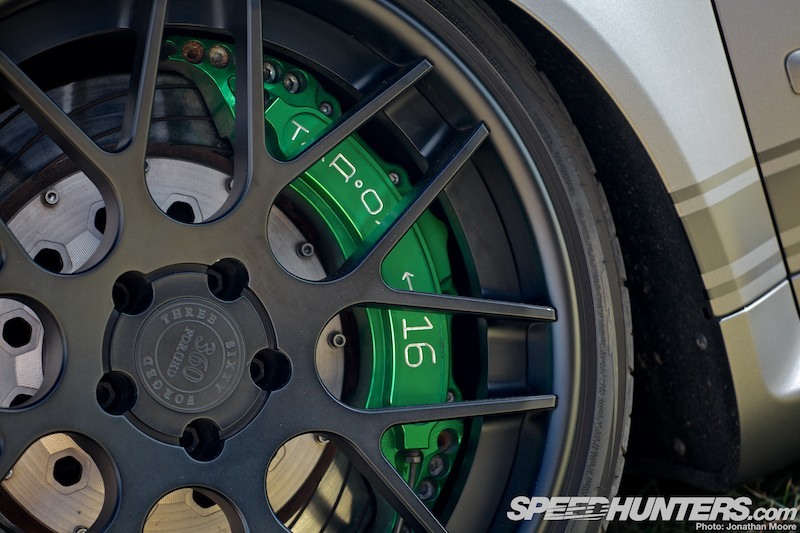 Another theme was ceramic brakes. 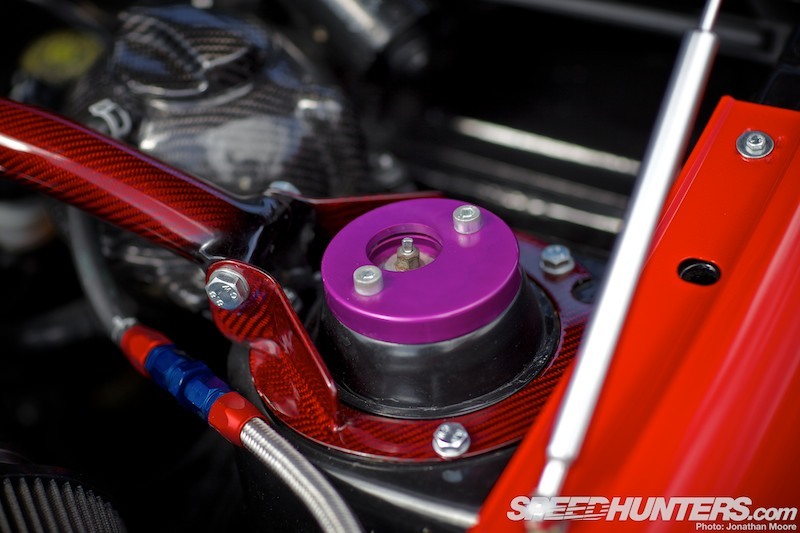 This huge stopping power on very low car combo has been around for a little while now. It does seem kind of pointless, but I do think it’s pretty damn cool. If you look on eBay, then there’s always a few sets for sale starting at around £6k for a front kit. A front and back set-up like this is well over £10k, which is nearly the price of a Mk VI GTI! You’ve got to admire the dedication of these guys who have to have the very best braking system on their car. I think I counted around five cars like this which were running a ceramic set-up of some sort. Pretty incredible stuff. The best thing about Edition 38 is that money doesn’t really matter. You can have any old car and it’s still possible to experience the event and have a lot of fun. The on-site camping and good weather this year made for an excellent vibe and it makes the three day show very accessible too. In the spirit of having fun with your car, I really do think that vehicle wrapping is great. It’s a fast way of giving your car a completely different look. This brushed aluminium look Audi A5 caught our attention. 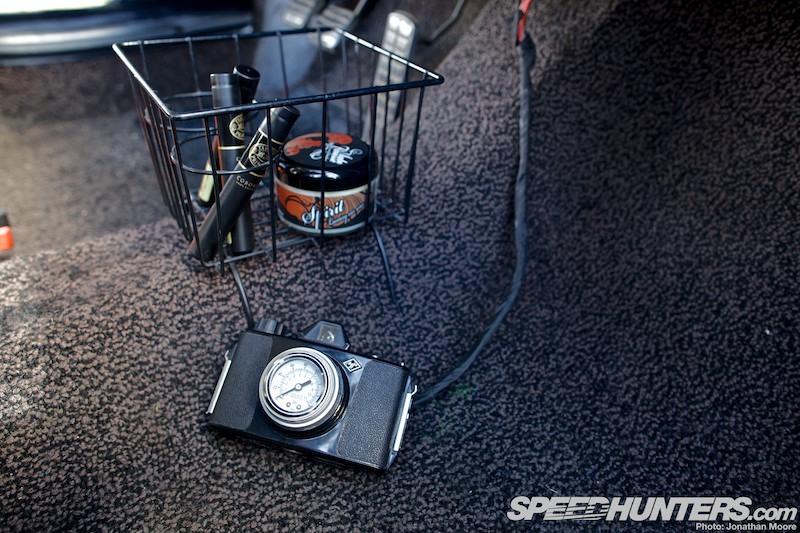 Running an air suspension set-up this was a high-impact build that could be achieved with little effort. A really fun and cool car. As usual, the Players Crew were in attendance with Carl Taylor giving his B5 Audi RS4 a fresh new look courtesy of a set of Rotiform IDKs. Both of his B5 platform cars are now riding on Air Lift Performance suspension systems with their V2 management and Air Lift were repping their extensive product line at the show. 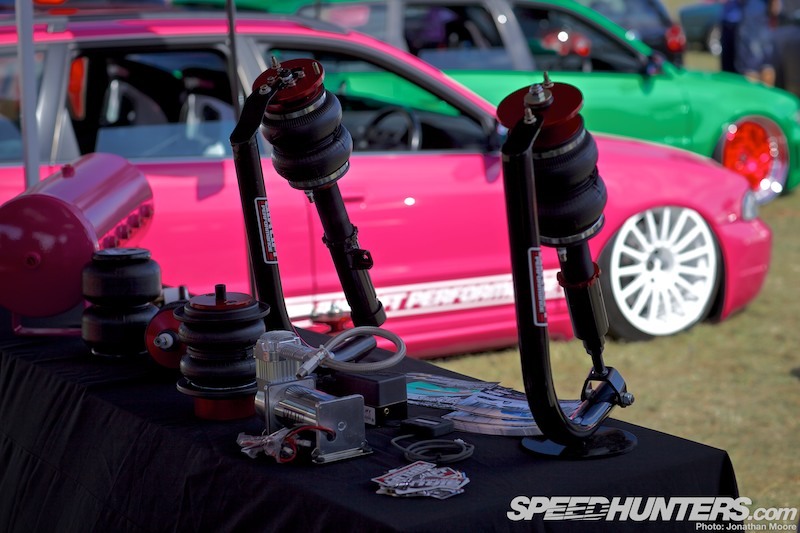 It seems like a lot of the VW community are having much fun with these cool suspension set-ups. 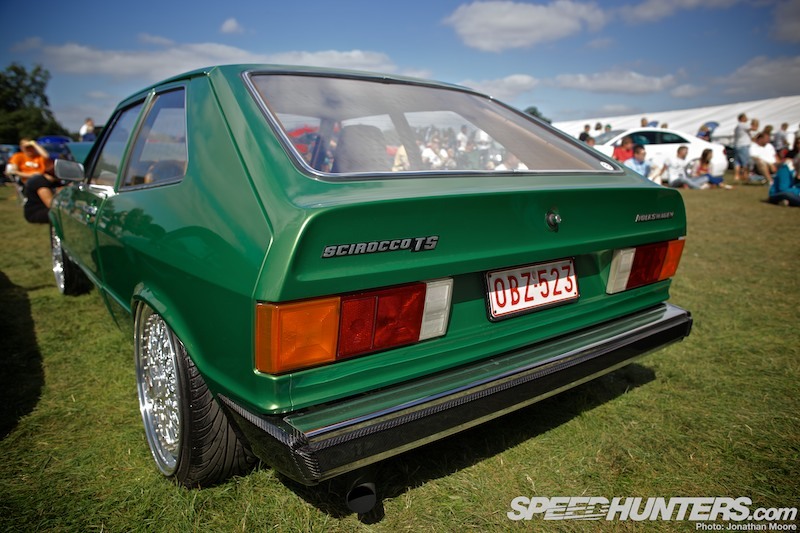 On the subject of air suspension, this Audi 100 was a showstopper. 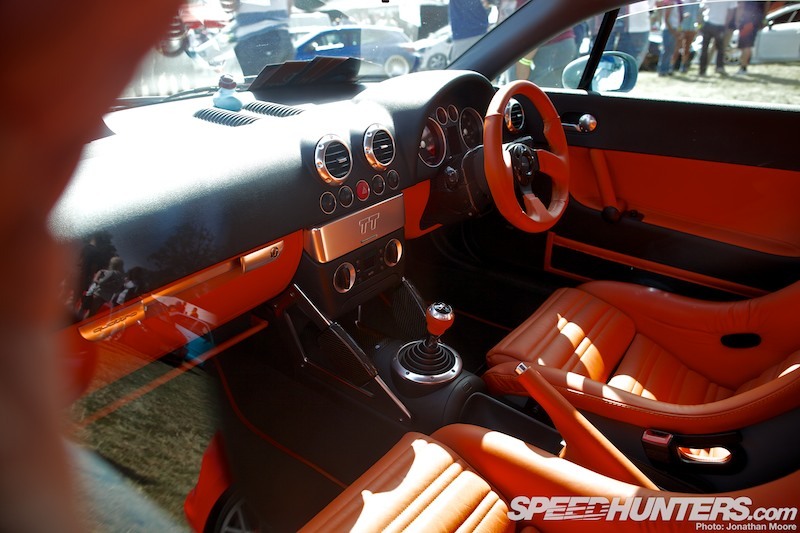 Volkswagen tuning is often about a celebration of fun and style. Accessories are regularly employed and the attention to detail on this old school Audi was very impressive. … with a complimentary dancing Elvis hanging from the windscreen. Fully awesome. … and showed that leather is still an excellent choice for trim work. Very cool. There are many Mk V and Mk VI Golfs running widened front arches giving extra wheel clearance. 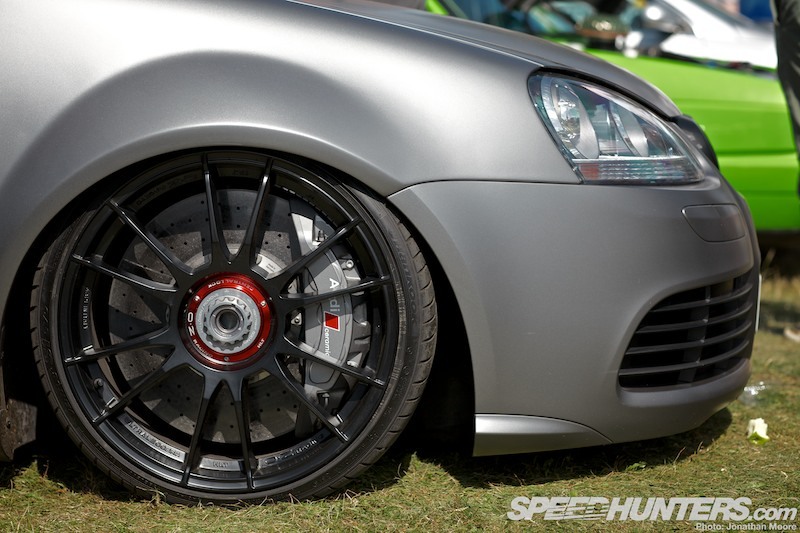 This carbon-arched Mk V on OZ Racing wheels demonstrates the extra width of the wheel arches up front nicely. More wrapping on Luke Massy’s supercharged Audi RS4 on Air Lift Performance suspension. Massy’s car has some mental 16-pot Tarox brakes too. Parked nearby the B7 RS4 was this Mk V Golf running ceramics. You can see a running theme of OZ Racing wheels, ultra low suspension and these flared arch kits that the owners of Mk V and Mk VI platform cars are enjoying right now. Kind of the polar opposite of these ceramic brake-wearing Golfs is this pretty fresh Volkswagen Up! build. I went in an Up! the other day and it’s a surprisingly roomy car to travel in. This new Volkswagen platform is starting to get some attention and I’ve seen a few cool examples in Japan. Maybe Dino will bring us an off the wall Up! feature sometime soon. The Up!’s bigger brother, Volkswagen’s Polo, has a bit of a cult following. 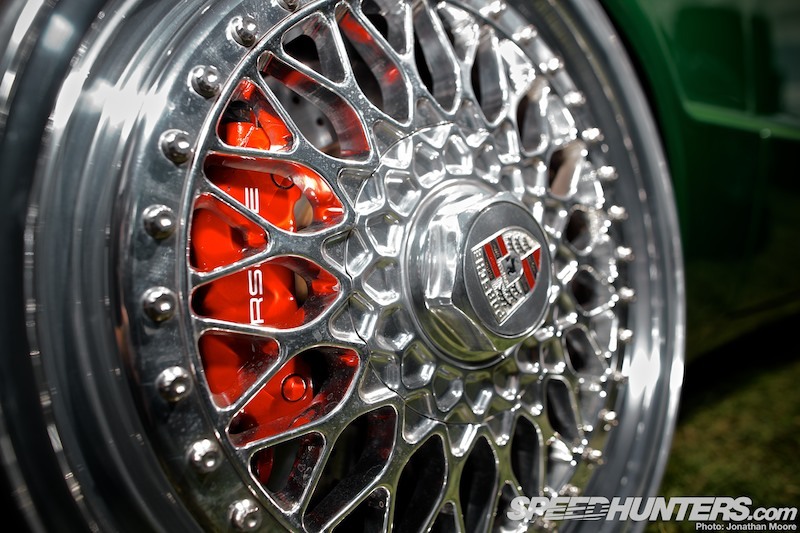 This 6N2 model featured some incredibly bonkers homemade BBS Turbo fan wheels. 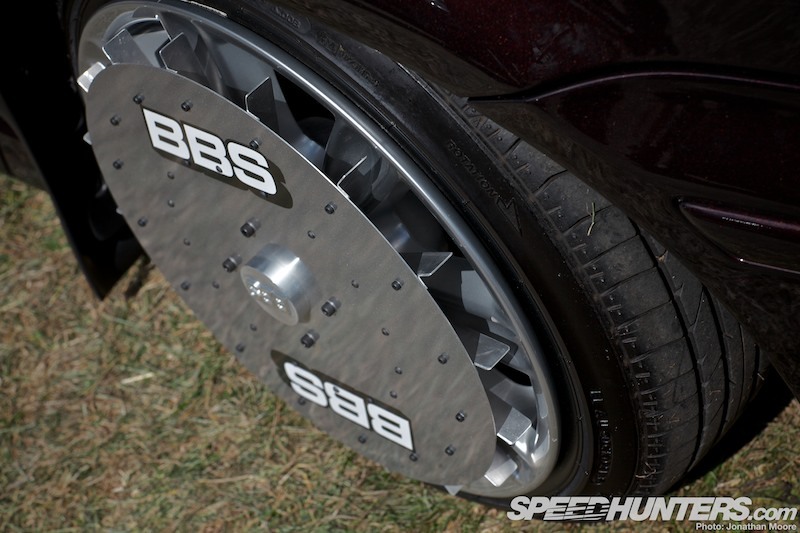 Behind the tongue-in-cheek creations the car features genuine BBS wheels and the owner takes these latest additions off when the car is driven. I think it’s a hilarious wave at the crazy money BBS fans are commanding right now and it kind of epitomises how the bulk of the people within the Volkswagen community don’t take themselves too seriously. The quality of the cars at this year’s event really was on point. The amazing Forge Mk I build will be coming to you soon as a full feature. I can’t wait to read about this. A Mk I with a different direction comes super-decked with a Westmoreland front end and a very aggressive wheel fitment. The Westie front lights and grille on this car give it a very retro feel and I love this look. Speaking of retro, the awesome DSP Golf III with 3.5 front end was on display too. Back in the day, French company DSP created some insane builds with gullwing doors. They produced two Golfs with this door conversion if I remember right. There was also a bananas Mk I Golf with a Spyder conversion, too. These guys were the kings of crazy! 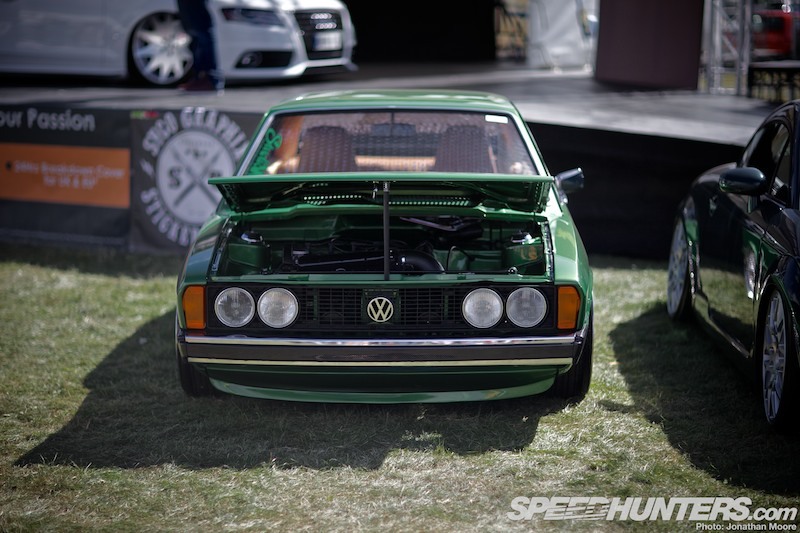 One of the things I love about the VW show scene is the variety. You also never know what you’re going to see – sometimes cars which have been garaged for years and you’ve completely forgotten about suddenly reappear looking fresher than ever after five years in storage. 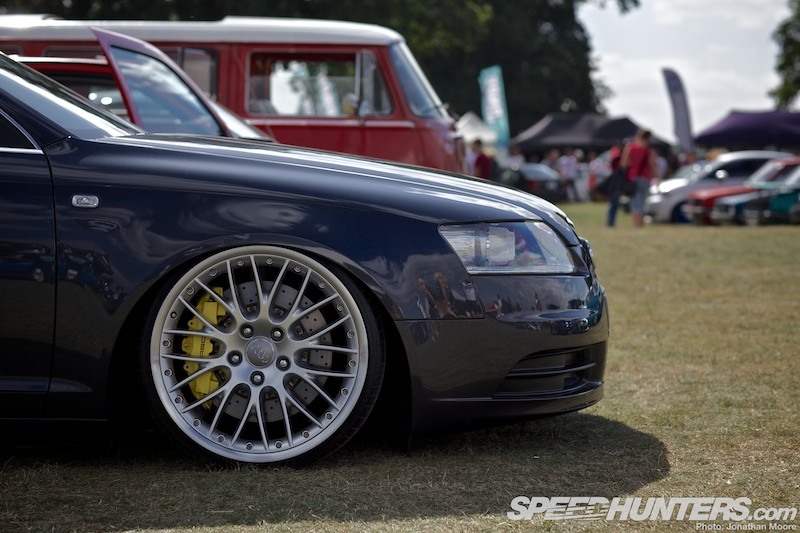 Edition 38 is, and probably always will be, the best VW festival in the UK. 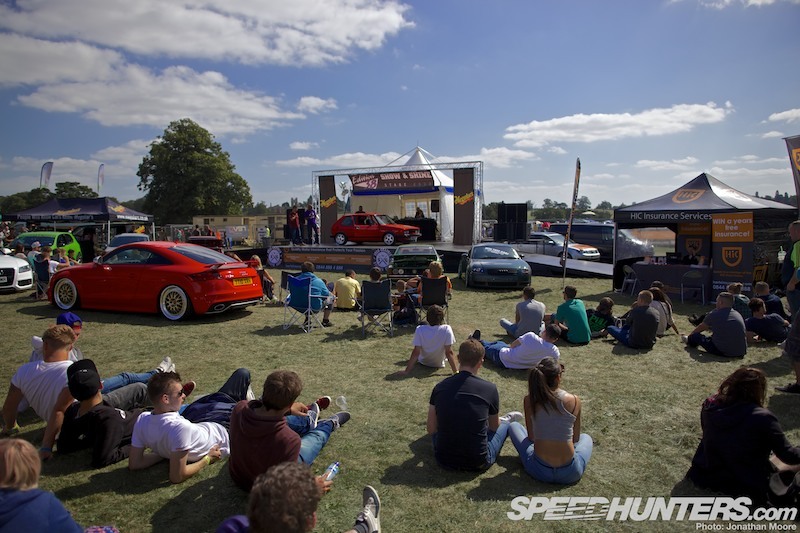 People travel from far and wide and when the weather is as good as it has been in England of late, it’s not hard to see why this event was so successful in twenty thirteen.